I have recently had the pleasure of joining this group of artisans, that are pulled together by etsy into a wonderfully varied and artfully displayed internet art and craft gallery, shopping and selling, experience. It is a great community of support, with many learning experiences available in everything from marketing, to photography to pricing and the list goes on and on. 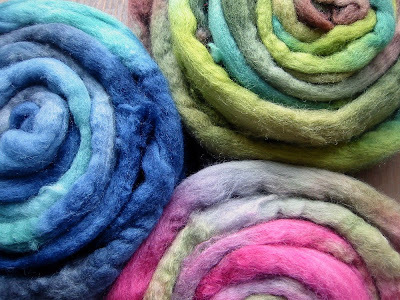 I have already learned so much, and as an artist, which can be somewhat isolating; it is great way to connect with fellow fiber or glass artists and share in the exploration of our mediums. As always the more I learn the more I find out that I have to learn. Something about these pinwheels of pure color just makes me smile. The colors of this handspun yarn were inspired by the April storms theme of my etsyFAST team (Fiber arts street team). 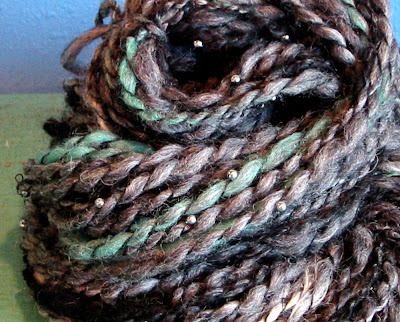 I spun this grey and white mill end roving with natural black alpaca and merino symbolizing thunderhead clouds with touches of a funky green that reminds me of the color of a stormy sky, right before you should be grabbing the cat and heading to your basement. Interspersed with locks of snowy white lincoln wool; cause in Wisconsin in April, you just don’t know when that rain will turn to snow. And plied with a french strand of cotton that is spotted with an abundance of glistening jet beads that look like raindrops. Soon I will post a matching skein of 110 yards that is plied without the raindrop beads.